In the 1960s, exploration was in the air, or more precisely exploration of the air had captured America’s attention. Space exploration was at the forefront of news. Russia and the United States were engaged in a space race to “boldly go where no man has gone before.” In the midst of all this frenetic activities, two men would do just that – they would go where no man or woman had ever been, nor have even been since. On October 5, 1959 the freighter Santa Maria left the port of San Diego. 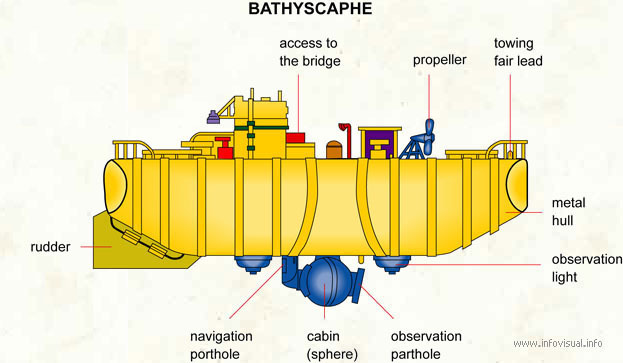 On board was the bathyscaphe Trieste. After traveling for months they reached the waters off Guam. 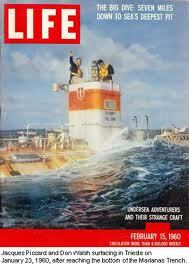 On January 23, Don Walsh and Jacques Piccard would enter the pressure sphere Trieste and slide below the waters. They traveled down over 35,000 feet to the bottom of the Challenger Deep – the deepest point in Mariana Trench (and the whole ocean). Their journey was remarkable in many regards. First, it had never been done before. Second, the ability for the bathyscaphe to withstand the pressure at that depth was not assured. In fact on the descent, one of the outer Plexiglas windows cracked. So these men were prepared to make the ultimate sacrifice in the pursuit of exploration. Third, it would be cold. While at the bottom, the temperature in the Trieste was 45°F. And fourth, at the time there wasn’t expected to be much to see once they got down there. The thinking at the time had been that without photosynthesis, there could be no life. We are now familiar with the diversity and array of life that can be found at the depths of the oceans where chemosynthesis occurs, producing food without light. There are deep sea corals living without the aid of photosynthetic zooxanthellae. There are hydrothermal vents surrounded by giant, swaying tube worms. While eating chocolate on the bottom, Walsh and Piccard were able to verify that there was life at depth as sole and flounder swam by. Walsh and Piccard ushered in a new age in marine exploration. From the view of their 2.5 inch wide (but 7 inch thick) window they were able to look out onto an ocean expanse never before seen by human eyes. They were viewing a whole new world, though they would be the last men to do so in person.